Last year I decided to start my year off by not making a bunch of resolutions, but by choosing a word I could focus on. I chose the word “Simple”. I’m really good at making things complicated and that usually leads me to frustration. By choosing to live by the mantra…simple…I truly felt calmer this past year. I kept my fitness routine simple by walking or jogging with the dog and playing tennis. I tried to keep my food choices simple by trying to choose God created food instead of processed food. My quiet time consisted of one devotional and my bible, instead of five books. It was easier for me to say “no” to something, because each day was qualified. My calendar was clean and….simple. We are now in 2015 and while keeping my life simple has been working for me and I think I can continue in this way, another word keeps coming to my mind…listen. Trust me, I’ve tried to think of a different word to focus on, like Joy or Encourage or even Healthy, but this one keeps flashing its little letters in my brain. Listen. What in tar nation does that mean? In conversations, I think I’m listening, but I’m finding myself thinking about what I’m going to say. Then, because I lack self-control, I just talk right over whatever the person is saying! How rude is that? I listen to the wrong voices in my head that tell me how no good, fat, ugly, and unworthy I am. When I should be listening to the only voice that counts: God’s. He loves me messy and pudgy. He loves me when I makes mistakes and when I fail. He loves me because I am not perfect and doesn’t expect me to be. Although I love a noisy filled house, I realize that I need to hear quiet too. Quiet is good for the soul. The world is filled with lots of crazy, sinful, awful and dirty songs, movies, books, articles and tv shows. What am I listening to? Lastly, what do people hear from me? Do I gossip? Do I complain, put down and shame? So, how am I going to practically focus on the word listen? I am going to shut my mouth and just listen. I am going to listen to the Holy Spirit that fills me. I am going to listen to what is true, not what satan wants me to believe. I will fight the losing words by memorizing scripture, reading more books by authors who are more knowledgable, and listening to what is true. I am going to listen to new and beautiful music of all kinds. I want to read books that will excite and stir my soul. I will watch more things on tv, in movies or through the Internet that will open my eyes to the good in the world around me. Truly listening to a friend’s thoughts and concerns could be the exact thing she needs. Just listening. My words can be hurtful or be encouraging. I want the words that a friend hears from me to build up, bring joy and hopefully be the light of Jesus. This is probably the most important part of the word listen for me. I am called to bodly proclaim the Good News of Jesus Christ so all may hear. I do believe. And If I know something so great, so wonderful and so life-giving, I should want to let everyone I come in contact to listen to me tell about it! But I get scared. So I guess my prayer for this year, is that I will share what I know about the love, forgiveness and grace of Jesus Christ to anyone who is listening. 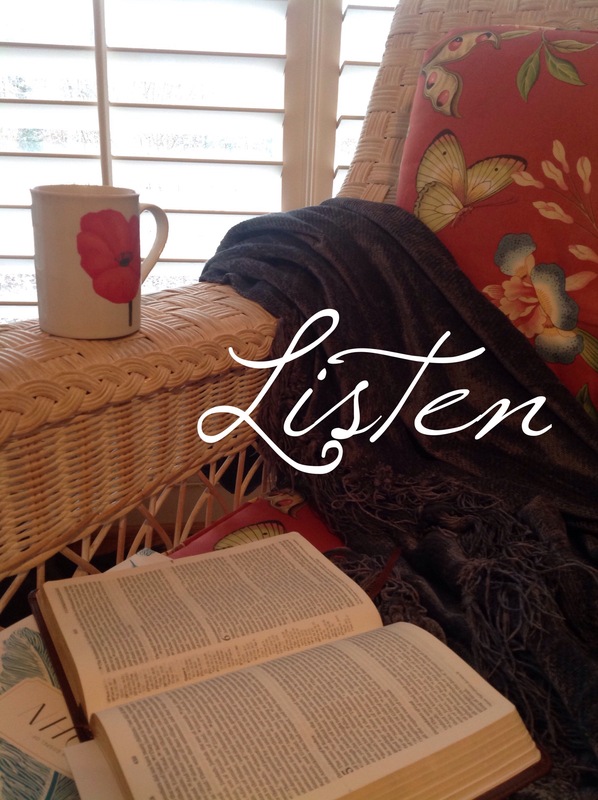 My word for 2015 is Listen. Posted on January 7, 2015 by mary •	This entry was posted in Faith and tagged word of the year. Bookmark the permalink.